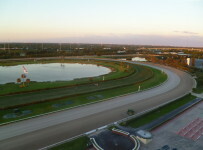 As of 10:31 a.m., the dirt track is listed as good and the turf course is listed as firm for Thursday at Gulfstream Park. First post is 1:15 p.m. for a ten-race card. 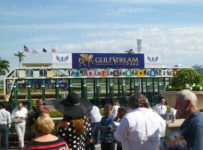 It will be Gulfstream’s first race day since last Sunday. We will have coverage during the afternoon on our blog, which may be accessed on the menu bar at the top of the home page of this Web site. 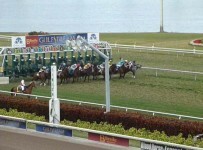 Heavy rain fell at Gulfstream on Wednesday, resulting in a track that apparently still needs time to dry out. The Weather Channel forecast is for a 15 percent chance of rain during racing hours in Hallandale Beach, where Gulfstream is located. The first, fifth, seventh and ninth races are scheduled for turf with the rail at 84 feet. The carryover on the Rainbow 6 is $142,730.50. The feature ninth race is a $25,000 optional claimer at 7 ½ furlongs on turf for fillies and mares 3-years-old and up. The purse is $43,000 and scheduled post is 5:34 p.m.
Cajun Queen is the likely heavy favorite. She has a three-race win streak–all on turf and all at Gulfstream but at lower levels than Thursday’s race. 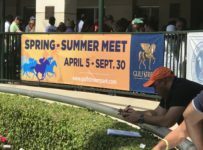 Tyler Gaffalione, who leads summer meet jockeys in wins, will ride for trainer Herman Wilensky.